1936. Replaced be two-story brick building, long-time Knights of Columbus. All images courtesy of Maynard Historical Society. 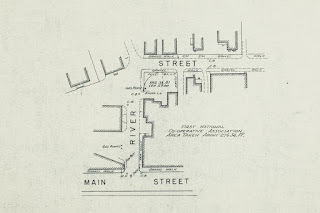 Riverside Co-operative Association was Maynard’s oldest. It was started by English and Scottish immigrants who worked at the woolen mill. Many of them may have been familiar with the co-operative movement in Great Britain, which by the 1870s numbered in the hundreds. Riverside began in 1875 as a chapter in an American movement, the “Order of the Sovereigns of Industry.” This was an urban workers organization modelled on the Grange – a farmers’ organization formally known as the “Order of Patrons of Husbandry.” ‘Sovereigns’ was in effect a buyers’ club with intention to secure high quality goods at lower prices. Locally, this meant buying wholesale in Boston, transported to Maynard by train, delivered in town by wheelbarrow. 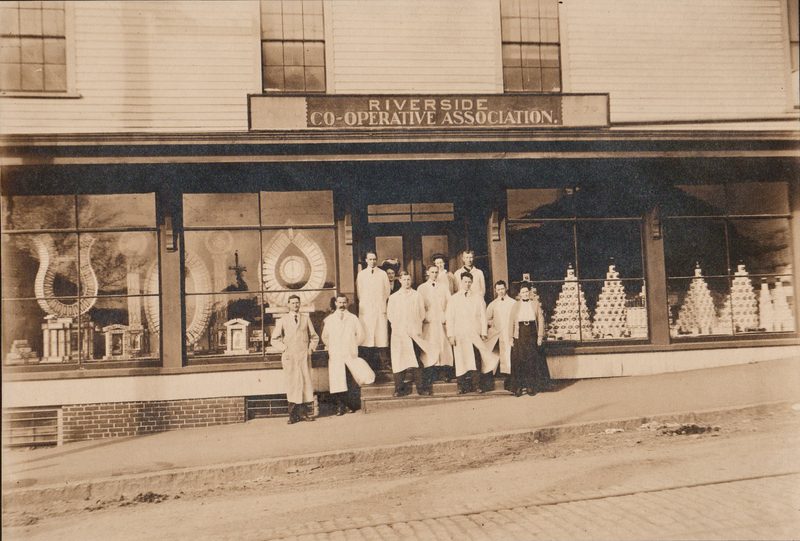 Nationally, the Sovereigns organization faltered under financial mismanagement, but in 1878 the local chapter reformed itself as the Riverside Co-Operative Association. Shares were $5 each (equivalent to about $125 in today’s dollars), members limited to 60 shares. The total capital investment was $1,500. Per the by-laws, regardless of how many shares owned, each shareholder had one vote. 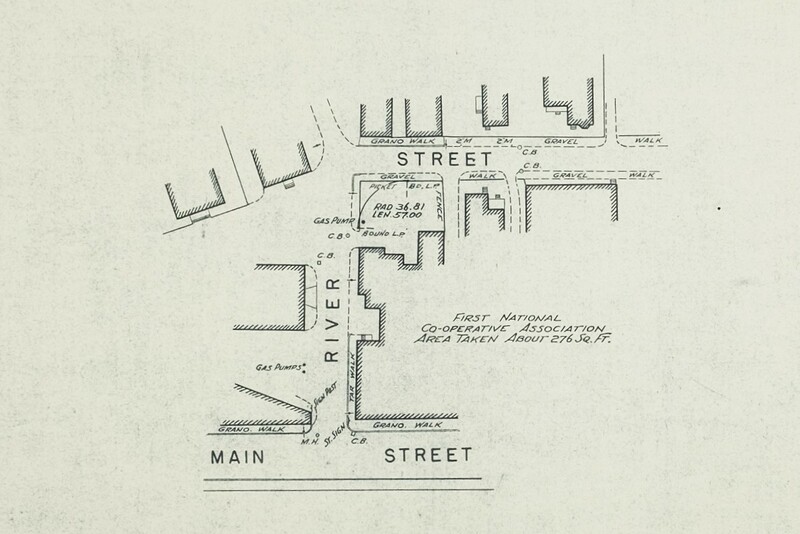 The operation started in the basement of the Darling Block building (northeast corner of Summer and Nason streets), moved to the Riverside Block (later Gruber Bros Furniture), and then in 1882 built its own building at the southwest corner of Summer and Nason. 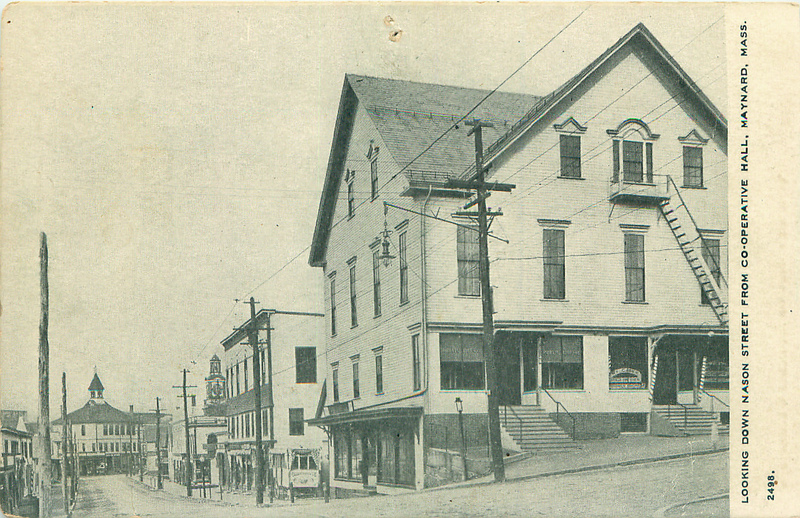 The building was a four-story wooden edifice, with the store on the first floor, entrance on Nason Street. The other floors were rented out. 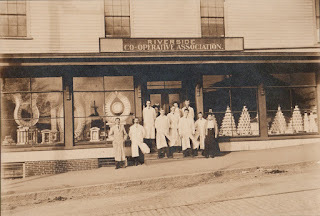 Riverside employees in front of store, circa 1920. By 1909, Riverside had more than 600 members. In addition to quality of goods and competitive prices, members were twice a year paid a cash refund ranging from 2 to 10 percent based on how much shopping they had done and how good a year the co-op was having. Additionally, shares earned five percent interest. Decline started with recession of 1920, compounded by cost of repair after a fire, same year. In 1929 the store business was sold to George Morse (the store manager), while the co-op continued to own the building. 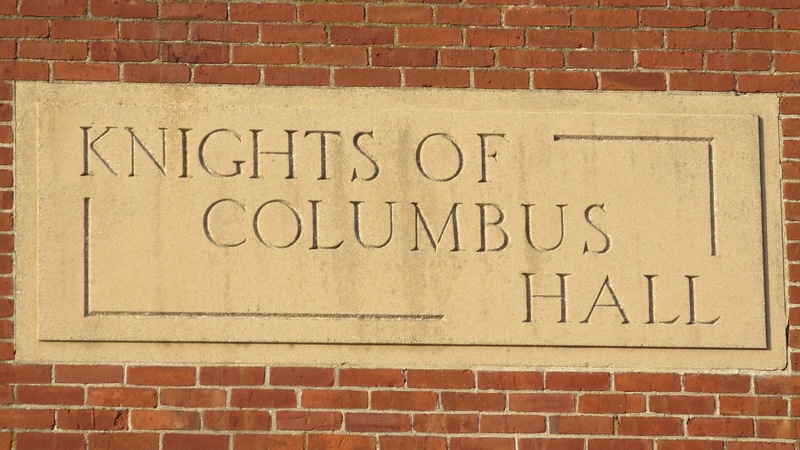 A large fire in January 1936 led to dissolution of the Association later that year and sale of the site to Knights of Columbus, which had been a long-time tenant. Proceeds were divided amongst the remaining shareholders. A document from the United Co-operative Society criticized Riverside as having emphasis on dividends to stockholders, but without an education program for members and their children, lost coherence as a social institution. Contributing factors were that the children of the founders of Riverside were moving up the socio-economic ladder at same time as England and Scotland were less of a source of immigrant labor. A front-page newspaper article from 1913 had noted that prior to 1900 the town was mostly English-speaking, but the expansion of the mill had doubled the town’s population by bringing in large numbers of immigrants from Finland, Poland, Lithuania and Italy. The rise and fall of the United Co-operative Society – the largest and longest enduring co-op in Maynard – will be covered in a subsequent article. There were smaller and shorter-lived efforts. Suomalainen Osuuskauppa, which translates as ‘Finnish Co-operative Store’, started 1899. Capitalized at only $800, it lasted a few years before dissolving and selling its store to a private owner. Maynard had a chapter of the Grange, started 1913, but unlike in rural situations, the Grange never operated a co-operative store. Gutteridge’s 1921 history mentions “Keefe’s Co-operative” without any details. The Historical Society has a share certificate for the Russian Co-operative Association dated 1917, but there is no other evidence in the collection that this effort reached its capitalization goal of $5,000 or became operative. corner of Main and River Streets (site now Thai Chilli). The Maynard Co-operative Milk Association was formed in 1914. Three years later it split, with some of the dairy farmers becoming the diary operations of the United Co-operative Society. The other members, who did not want to affiliate with the Socialist/Communist atheist United, formed the First National Association, which existed to 1941. It owned and operated out of a building on the corner of Main and River streets that had been the Somerset Hotel, site now occupied by Thai Chilli. The International Co-operative Association was started in 1911 by immigrants from Poland. It lasted 20 years. It began in a building near the Methodist Church, later moved to space in the Masonic Building. Membership numbered 200 to 400 over the years. First National and International failed in part because of extending credit to members during the Great Depression.